Madhuraantakam, located near Chingleput South of Chennai enshrining the Kodandaramar popularly known as Eri kaatta Ramar is associated with legends from the Ramayana. The name Madhuraantakam arose from the belief that this town had very pleasing surroundings (borders). Legend has it that a rishi by name Vipantaka served Rama on his way to Sri Lanka and requested him to visit him again. It is believed that when Rama was returning to Ayodhya from Lanka in his Pushpaka Vimaanam the celestial vehicle stalled when it reached the abode of the rishi, thus reminding Rama of his promise to visit the sage again with his consort Sita. The beacon of the Sree Vaishnava tradition - Ramanujacharya was initiated into the tradition by Periya Nambi at this shrine, under a tree behind the Aandaal shrine. The name Eri Kaatta Ramar arises from the following legend. A British collector in early nineteenth century is said to have witnessed the spectacle of Rama and Lakshmana protecting the Madhuraantakam reservoir when the reservoir was in danger of breaking and flooding the entire region. In acknowledgement, this collector is said to have renovated the Thaayaar (Sita) shrine in the temple. His contribution is acknowledged in inscriptions seen in the shrine. The Temple has a five tiered Rajagopuram and three circumambulatory passages and separate shrines to Kodandarama, Janakavalli (Sita), Lakshmi Narasimha, Aandaal. History: This ancient temple is said to have been in existence prior to the reign of Rajaraja Chola. The town of Madhurantakam (Madhurantaka Chaturvedi Mangalam) was created by Parantaka I (as in the case of Veeranarayanapuram or Kattumannargudi). The irrigation tank nearby is also attributed to him. Inscriptions refer to Rama as Ayodhya Perumaal. This temple, although from the period of the later Cholas, was renovated at a later date. 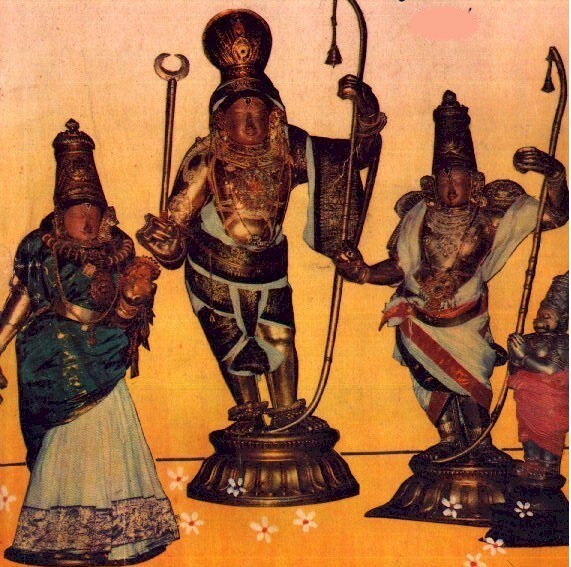 Festivals: The annual festival is celebrated in the Tamil month of Aani and the Kalyaana Utsavam is celebrated in the month of Pankuni. Other temples: The Arulaleswarar temple dedicated to Shiva is located nearby. There is another Shiva temple (Swetaranyeswarar) near the Madhurantakam railway station which has several inscriptions from the Chola period. Its foundation goes back to the period of Parantaka Chola I (early 10th century). It was re-constructed during the period of Kulottunga I (1075-1120) , and its second prakaram was added during the period of Kulottunga II.